This application is intended for individuals or organizations who are currently working with a Partnerships for Parks (PfP) Outreach Coordinator or Catalyst Community Organizer and wish to plan and lead a volunteer service project in their local park. Service - Include a volunteer service project to beautify or improve a NYC Parks property. Free - Projects must be free of charge to participants. Deadlines - Applications must be submitted by the 1st of the month for the following month's projects. Late applications will not be accepted. Please refer to table. Help - Have questions? Please call your local PfP Outreach Coordinator or the central office at 212.360.1310. Have you led an It's My Park project before? Who is your Partnerships for Parks Outreach Coordinator? Would you like to receive emails from Partnerships for Parks? 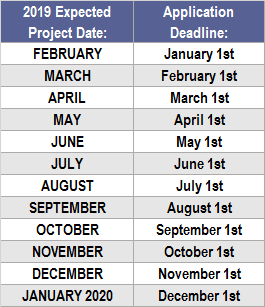 Project Date: Please list two preferred dates for your project. Please choose a project date on or after June 1, 2019. How long will your project last? If applicable, please list other groups/organizations you will be working with in your park. Through the It's My Park program, we can help promote your project by including events on our websites and providing marketing materials, like posters. Would you like to have your project posted on the NYC Parks events calendar and the City Parks Foundation events calendar? Would you like promotional materials for this event? Partnerships for Parks offers customizable It's My Park posters and postcards to promote your project. We will do our best to accommodate your needs, however quantities are limited and we may not be able to fulfill all requests. Please Note: May require 'Special Events' permit. Please describe precise location in park. Supplies are limited, so please estimate accordingly. Do you need painting supplies? Yes No Unsure If unsure, your PfP coordinator/community specialist will contact you to discuss further. Do you need hard tools? Your request will be processed and your Outreach Coordinator/Catalyst Community Organizer will contact you with further information and next steps for approval. We look forward to working with you.